As you can see we are parked in a walled compound. Note that the wire fence along the top of the wall by Mel is electrified. The metal gate between our compound and the street is kept locked at all times and you have to ring to be allowed in or out. 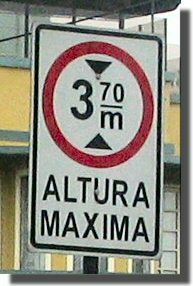 We are not in the centre of Lima but in the "far safer" southern suburb of Miraflores. 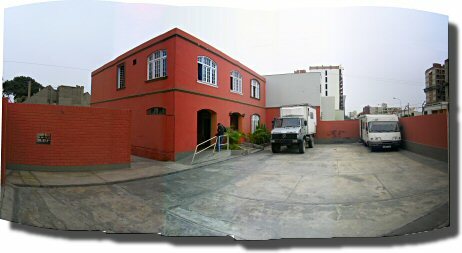 Our home for three or four days is Hitchhikers (a B&B backpackers hostel at Calle Bolognesi 400, Miraflores, Lima. S 12.122422, W 77.036070). The charge to park here is about $4.00USA per person per night. N.B. the Witch House which used to be situated near here is no longer in operation. The observant will have noticed a K-Nine sized gap between Mog and Mel. K-Nine is currently at the Divemotors Mercedes garage about 6km away at S 12.084167, W 77.012972, having work done on the brakes and suspension. This may take several days. The very very observant will have noticed that the roofline of Mog is no longer symmetrical! Mog is, or rather was, 3.55 metres tall. 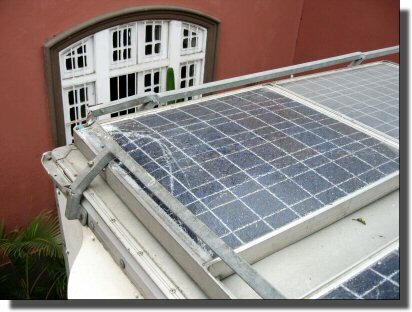 The top 150mm of that is a sort of roof rack that protects and supports four solar panels. Backing out of the underpass was reasonably easy because we had opted to drive thru the centre of Lima on a Sunday and there was little traffic. As well as getting mechanical work done on K-Nine we are also waiting for Judy's Brazilian visa to be issued, a process that could take four days. At least Hitchhikers offers free Internet, and an extensive DVD collection (including the ever popular American Pie IV and Jeepers Creepers II ). There are several fine restaurants and a gourmet supermarket nearby.